Forged from a chance encounter at a music camp on a Florida beach, this duo brings together two musicians with shared musical roots and diverse careers. Violinist TRICIA PARK, Juilliard graduate and winner of the prestigious Avery Fisher Career Grant, has performed at Carnegie Hall, Lincoln Center, and with orchestras around the world. Violinist and fiddler TAYLOR MORRIS, who spent four years touring the world with renowned fiddle group Barrage, received a master’s degree in education at Harvard and works with students to explore musical creativity through diverse styles. 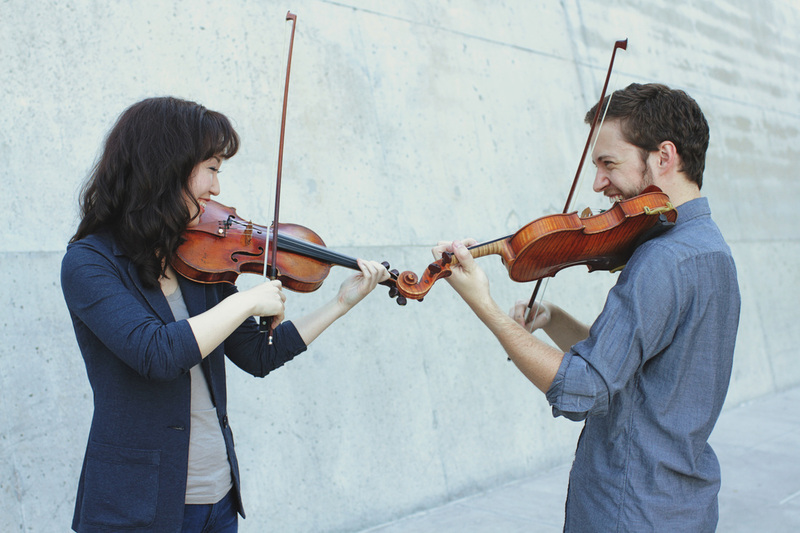 Together, TRICIA & TAYLOR use two violins to better understand the multicultural age in which we live, performing music from genres and cultures around the world. Get to know more about Tricia at www.triciapark.com. Hailed by a class of 2nd graders as “wreely nice and kind” and “the coolest man on erth,” Arizona native Taylor Morris enjoys blurring the line between violin and fiddle. After studying classical violin at Arizona State University with Dr. Katie McLin, he spent four years touring the world as one of five fiddlers with Barrage, a world-music violin troupe based out of Canada. His travels, both with Barrage and personally, have led to performances in 48 states and 13 countries with musicians from a multitude of backgrounds. Strongly believing we can learn more about the world through collaboration with others, Taylor actively pursues musical projects in different genres. Currently, he is part of Tricia & Taylor, a genre-bending violin/fiddle duo with concert violinist Tricia Park, and a member of The Sound Accord, a string sextet that creates vibrant arrangements of folk music. Other performers with whom Taylor has recently collaborated include: multi-style cellists Mike Block, Rushad Eggleston, & Natalie Haas; fiddlers Hanneke Cassel, Casey Driessen, Jeremy Kittel, & Lauren Rioux; arts educator Steve Seidel; and the Tetra String Quartet. Offstage, Taylor obtained a master's in education from Harvard University and is a passionate advocate for arts education. Since 2000, Taylor's teaching has taken him into classrooms around the country, with activities ranging from creating music-inspired art with kindergarteners to leading workshops at the University of Notre Dame, University of the Pacific, Millikin University, and Arizona State University. His varied work has also led him to be selected for presentations at each of the major national conferences for music educators: American String Teachers Association (ASTA), Midwest Clinic, and National Association for Music Education (NAfME). As a kid, Taylor loved going to summer camps; as an adult, Taylor still loves going to summer camps. In addition to having taught at camps in Florida, Illinois, New Hampshire, North Dakota, South Carolina, and Utah, he directs StringPlay, his own camp for young musicians in the Phoenix area. During the year, Taylor's main educational outlet is serving as a founding co-director of the Gilbert Town Fiddlers, an extracurricular high school fiddle group that collaborates to create its own arrangements for performance. Currently, he is in the midst of a three-year project as a Guest Lecturer at Arizona State University, working with Dr. Katie McLin and her students to explore multi-style music education and entrepreneurship. Through his teaching, Taylor is ultimately on a serious mission to keep music as fun as possible, working with students and educators to explore the incredible variety of ways to make music with string instruments.